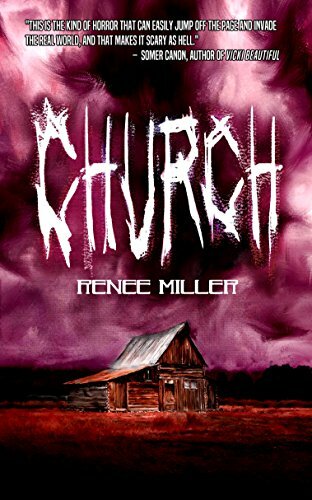 Starting off my Unnerving foray is Church by Renee Miller. I've been hearing lots of good things about this book. This tale is about a young man, Ray, a devout Christian who is over the moon with meeting Carol, the love of his life. She's perfect in every way except for one thing. She belongs to a looney cult, known only as Church. At Church they follow the alien god Zabir who speaks through the Prophet. But Ray is open to this, he thinks he can save her and turn her to his church and marry her making her the perfect wife. He goes along to this strange church not to seek permission from the Prophet for Carol's hand in marriage but to steal the churches devout followers. He believes doing this will save their souls. But of course in all good tales, things don't go to plan. The Prophet wants to convert Ray, but can Ray hold on long enough through the torture and mind control to save the woman he loves? Church is a really creepy book, one that ended too fast. I loved it and devoted an entire day to it so I could read it in one sitting! The set up is really clever, as a reader we're given a glimpse into the inner workings of the church before Ray. We're exposed to its horror long before Ray is which makes you want to scream at him, urging him to turn around and drive away when he sees the red sign. As well as being a great story it goes a long way to illustrate how some religions are used as a method for exerting control over others. There's a dark greed underlying the church which soon becomes appallingly apparent. The Prophet, aka Darius is a truly terrifying character. He is so cold and devoid of humanity he could almost be reptilian. He doesn't believe in his church he believes in power. He has no regard for his devout followers he has broken, of their commitment to living by the church. And why is he so good at what he does, why do all these people stay? He is a true pro able to turn on the charm as easily as his descents into depravity. There's something very real, about this book, you can easily imagine this happening in real life over and over again. It seems very plausible this could be happening right now not far from where we live. I would love to see a follow up to this, its such a great setting with great characters.